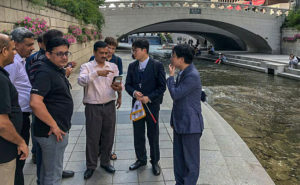 Seoul: With an idea to revive the Yamuna River, Delhi Chief Minister and Aam Aadmi Party Chief Arvind Kejriwal are in Seoul to see how Cheoggyecheon stream was transformed into a tourist spot from a polluted water body. The Chief Minister was accompanied by the Urban Development Minister Satyendar Jain on his visit to South Korea making it the first ever such bilateral visit to a foreign country after attaining the post of chief ministership. Along with that, Mr. Kejriwal also attended another Indian Festival event going on in South Korea – ‘Sarang 2018’ at Yonsei University and praised the Indian Embassy in the Seoul for taking step towards the introduction of India’s heritage to Koreans. “I am extremely pleased to participate in this festival and happy that the embassy has taken initiatives to showcase India’s culture to Korea… And, this music fest is being launched today. I am very pleased, and I am here to attend a conference, to sign an agreement between Seoul city and Delhi city,” he said in his address. The stream, Cheonggyecheon runs for 8 km long stretch flowing from west to east through downtown Seoul and then meets the Jungnangcheon which in turn connects to the Han River and fills the Yellow Sea. But it was a different scenario several decades with Cheonggyecheon seen as an eyesore and the stream was covered with concrete for roads and the public transportation was built very later on. The Seoul Metropolitan Government undertook a restoration work for the stream in the year 2005 and then renewed it. The restoration work taken up for Cheonggyecheon stream served the purpose of preserving the unique identity of the natural environment and the also the historic resources in the central business district of Seoul. Apart from that, it also reinforced the surrounding business area with facilities for information technology, digital industries, and international affairs. The Aam Aadmi Party also posted pictures in this regard of Mr. Kejriwal’s visit on Wednesday on Twitter. “Delhi CM @ArvindKejriwal & Urban Development Minister @SatyendarJain visit the Cheonggyecheon stream in downtown Seoul. Cheonggyecheon stream was a dirty polluted stream stretched around 11 km, said to be urban regeneration marvel as it is now a tourist hotspot,” AAP said on its Twitter handle. “CM @ArvindKejriwal is in Seoul for Twin City Agreement b/w Delhi & Seoul on Pollution, Water, Public Transport, Education & Urban Devp. 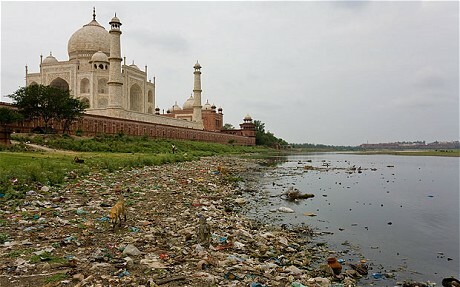 If Cheonggyecheon stream in downtown Seoul can be regenerated to a tourist hotspot, why can’t river the Yamuna & drains in Delhi be revived ?” the party said. On Wednesday, A Carnatic music concert was also held at the Yonsei University on its 100th anniversary.